4.1 out of 5 based on 14 bloggers and 1 commenters. 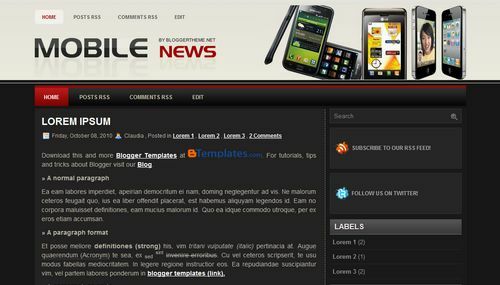 Mobile News is a free blogger template adapted from WordPress with 2 columns and right sidebar. Hey, I just downloaded mobile news templates, and I have a question. where it the navagation bar is (above the blog post,below the website logo) how would i edit it to my liking, For example if i wanted to change the POST RSS tab to something like REVIEWS. how would I do that, I looked in the FAQ section and I could find the HTML code they mentioned. please help!